Beautifully handcrafted in subtle tones and smooth texture. Be a proud owner of this Kashmir woolen hand knotted rug woven by our skilled artisans. It has taken 4-5 months to weave this piece. Since each rug is "One of a Kind" and exclusive, this product is currently not available. However, please fill in your details below, for us to check for something similar in our warehouse. Enhance your space with this Tree of Life pattern rug. The design has been intricately woven in a mix of fine quality wool and traces of silk. The pattern has been originated from Persia and is one of a kind. The detailed intricacy of the rug gives it a unique look. 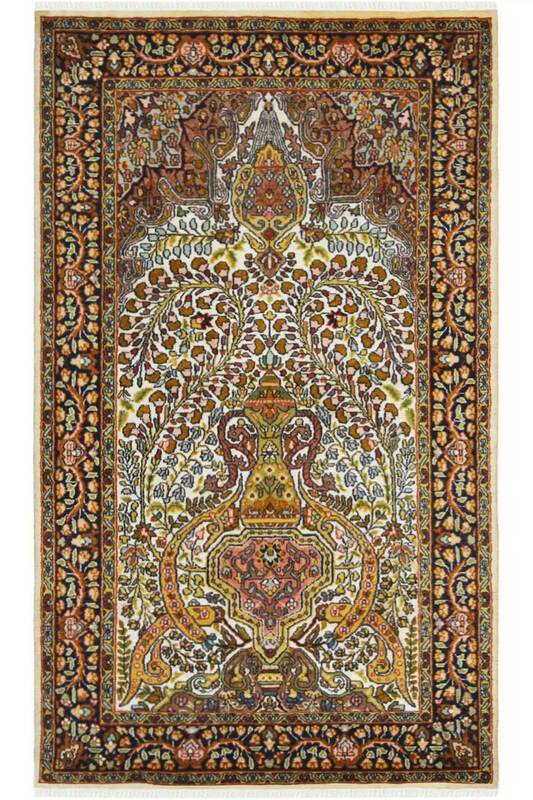 This rug has an all over Floral design with a Tree of Life motif. The design has an Iranian influence. There is a bed of flowers throughout the rug with tiny motifs and on an ivory cream background. The border is intricately woven with detailed floral pattern and has taken about 8-10 months to weave this gorgeous beauty. This rug is of superior quality and is finely woven. Rugsandbeyond's recommendation is to use this rug in a space with beige-white interiors. It can also be used as a wall-hanging.